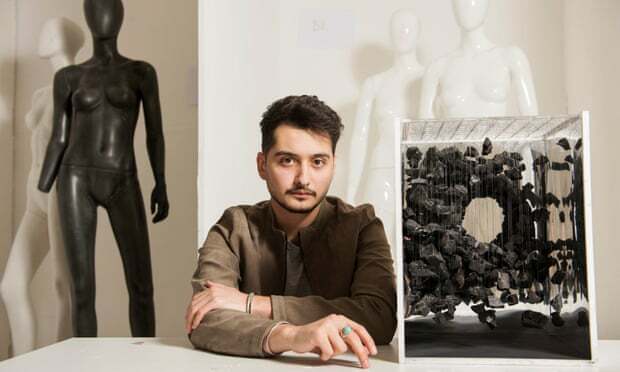 Sat in a studio at London College of Fashion, surrounded by faceless mannequins, bent coat-hangers and ripped fabric, Ammar Alsaker grins indefatigably as he recounts his journey from his home of Damascus to these most unlikely of surroundings. After enduring three years of conflict in Syria, he fled Damascus alone for London, a journey that took nine months and saw him negotiate with people-smugglers, pass through Lebanon, Turkey, Greece, Belgium, Spain and Scotland, and earn thousands of euro as a translator for the world’s media – all as a teenager. Once he was granted refugee status, he continued to strive to realise his dreams, applying to universities and repeatedly turning up at Topshop HQ to demand the attention of its most senior executives so that he might land a role with the retailer. Now 23, in the second year of his bachelor’s degree and working for Topshop, he is focused on his next challenge – to persuade the UK government to relax restrictive rules so he can reunite with his family – including the two-year-old brother he has never met. Alsaker hopes sharing his story might challenge negative stereotypes of asylum seekers and refugees and win support for calls to change immigration rules that only allow adult refugees to apply for their spouses or children under 18 to join them. Alsaker is one of six siblings who grew up in Damascus in a “humble house”. His dad is a tailor, who before the conflict ran a newborn clothing business. In 2012, the fighting broke out and life for Alsaker changed irreversibly. Explosions, burnt-out cars, and gunfire became a daily occurrence for him and his family. Soon, checkpoints started appearing every 100 metres all over the city. Whenever Alsaker wanted to go out, to work, to study, to visit a friend, a soldier would ask for ID. The abuse from soldiers became overwhelming. Alsaker recalls being ordered into a small mobile unit in the middle of a delivery to an Adidas store. What started as harassment escalated to a gun being held to the back of his head. Shortly after, in November 2015, he told his father about the incident and Alsaker and both his parents decided it was time to get their eldest son out of the country. His father drove Alsaker to Beirut and booked him on to a flight to Turkey, unsure if he would see his son again. “You’re already in danger but you have to put yourself in more danger to be safe again,” Alsaker says. He started looking for a smuggler and soon found one. He paid $1,000 for a crossing from Turkey to Greece. It was all the money he had. On the journey across the Aegean Sea, there were amputees, babies throwing up and screaming. “It was the biggest test of my whole life,” Alsaker says. After arriving in Greece he was given six months’ permission to stay. He made his way to the border with Macedonia in Idomeni where an emergency camp had been constructed. He and 15,000 displaced people were stuck in limbo. Alsaker describes a daily queue for an egg sandwich at the camp as one of the most important places on his lengthy, arduous journey. It was in this queue when he overheard a freelance journalist complaining that no one spoke English. 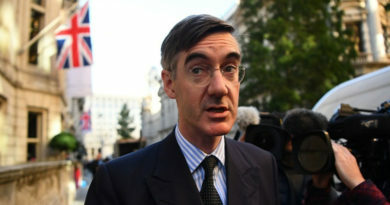 At first he turned down an offer of payment but shortly after he was put in touch with many other reporters, all of whom insisted they had to pay Alsaker. Over the next five months, Alsaker worked for Time magazine, HBO, This American Life, Channel 4 and others, and made several thousand euro – all paid in cash and tucked into a plastic money container worn round his neck and tucked under his T-shirt. He knew what he had to do with the money he had earned. “I started looking for another smuggler,” Alsaker says. “I thought – I can go to the UK now and achieve my dream.” He went to Athens and soon found a smuggler who charged €6,500 to get him to the UK. Alsaker was handed two fake passports and booked on to a first-class flight from Athens to Brussels, another flight from there to Spain and another to an unexpected destination. It was August 2016. Alsaker left the plane and immediately claimed asylum. He was taken to a detention centre but shortly released and returned to the airport for an interview. At the time, Alsaker still had some money left from his translating work so he was not immediately placed in supported accommodation. As a result he spent his first two nights in the UK on a bench in Glasgow Central station. After two months he was relocated to London. Living on £36 a week, unsure if he would be granted refugee status, he started to apply for universities. He was granted refugee status in April 2017. In late September, he started his degree in visual merchandising at the London College of Fashion. But Alsaker wanted to push himself further. After trying and failing to meet the head of visual merchandising at Topshop HQ, he started to canvas stores across London. A few months passed and he was offered a job at the Stratford Westfield store in east London. Despite his success against the worst of odds, there is still something that bothers Alsaker. “Not having my family with me,” he says. Alsaker’s mother was pregnant when he left Syria. That child – his little brother – is two now. He has never met him in person. They have spoken over video chat on his phone. That’s why he is backing the #familiestogether campaign supported by more than 20 organisations including Oxfam, the Refugee Council, the British Red Cross, Amnesty International UK and UNHCR. Alsaker smiles throughout the interview. It’s an irrepressible smile that somehow breaks through as he recalls experiences that would bring most of us to our knees – but that is just Alsaker, a young man who sees hope and humour where many would not. The campaign to relax family reunion rules is at an advantage with him on its side. He is a man who never gives up.